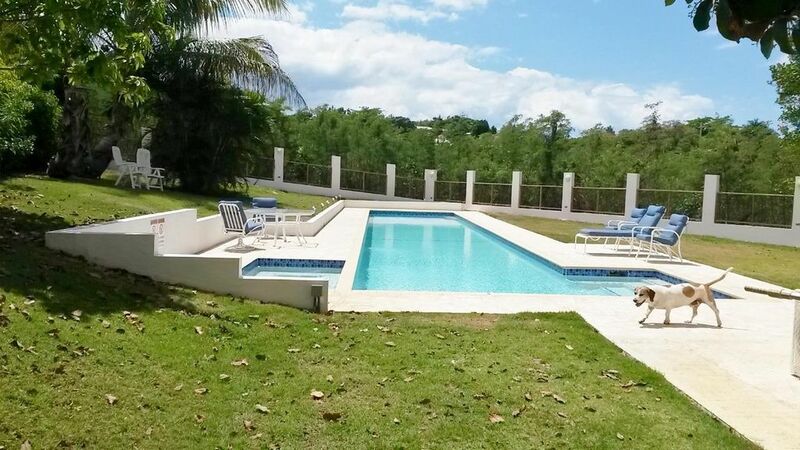 The apartment is in the exclusive Colina Linda cul-de-sac area of Puntas, Rincon. It is perched 100 feet above the Huffington Post-rated, world's 7th sexiest beach, among Surfing Magazine's 30 best surf spots, and 3 blocks from USA Today's Best Caribbean Beach Bar - Tamboo Tavern. The apartment is the first deck of a 3-story villa. It has 2 bedrooms, a bunk-room, with living room, full kitchen, and bathroom: sleeps up to five -- 4 adults + 1 child or 3 adults and 2 children. The backyard includes a 65' x 12' x 4' salt water lap pool and a Jacuzzi. There is a large back-up generator, water cistern, and electric gate. Rates are $195 per night Dec-Apr and $145 per night May-Nov. 10 percent discount for active, reserve, and retired U.S. military. The Rincon Hilltop Villa has many advantages. It is high enough to get the cooling trade winds, but is far away enough to avoid salt spray and any hurricane waves. The apartment is at the western tip of Puerto Rico. The exclusive Colina Linda community has seven million dollar homes on a cul-de-sac. The lap pool, Jacuzzi, back-up generator, water cistern, electric entrance gate, DISH satellite TV and wireless internet, lets you get away from the urban environment and enjoy the rural atmosphere, but stay connected -- if desired. Dish TV service on TV in living room. Public tennis courts in Rincon at Municipal Sports Complex. 15 miles north for Borinquen Golf Course. 25 miles north to Royal Isabela Golf Club. We are a family of 5 and we Stayed at jim's property for a total of 7 amazing days. The property is clean and well kept. My kids loved the pool and they went swimming every day. Great air-conditioning. Amazing location right above Sandy Beach. Jim is a great host as well. This is my second time staying at Jim’s house and it was just as awesome as the first time! We just stayed at this rental for the second year in a row. What a magical place! The house and pool are amazing. It seriously has everything you need and is just a short walk to the beach, coffee, restaurants and shops. Since we stayed last year Jim has upgraded the kitchen and added a water dispenser. Jim and Jake (dog) could not be nicer and are super responsive and helpful when needed. This rental and owner have made Rincon an annual trip for our family. We cannot wait to come back! Rincon is a very special place! We have been to this area before. Great access to the beaches, some walkable. You can go to yoga under the almond trees everyday or get a massage on the ocean. The surfing is reknowned and there are many local options for good waves. The Hilltop Villa is very comfortable, great breezes and outdoor space. The pool was fantastic! Jim is the best host. Always available if needed. There are plenty of very good restaurants to choose from; food stores, Farmers market, Artwalks weekly in the Town square. If you want to have a nightlife and music, it's here. If you want to just hang out at home, it's very comfortable. I wouldn't hesitate to recommend Hilltop Villa. We will be back! Jim is a very good host, making special accommodations to the home to make traveling with small children easier. His home did not have a pack n play for my 20 month old - but he ordered one and had it set-up for our arrival. His dog Jake was also very sweet to my children. He has materials/maps to use as resources for the area, boogie board, snorkeling equipment, beach chairs, sand toys, etc. Jim is also a great resource. House is nice (solid kitchen, bathroom, beds) and also has a wonderful lap pool, hot tub and outdoor shower. Was a great set-up for our family which requires separate spaces for naps still. Yard is also nice. The home is wonderful for watching the stars at night while listening to the ocean, which is right down a hill. Sandy beach isn't the best for swimming with young children but there are plenty within a short drive. Area also felt very safe for our family. Neighbors all knew each other and seemed to love where they live. One more time we stayed at the Rincon Villa. The place is simply amazing. Jim made many renovations to the whole place (kitchen, bathroom, bedrooms). He was in the property this time but he is so quiet that you won't know he is there. Upon arrival he even had a tray of fresh fruit for us. These details and the amazing pool is what make us keep coming back. Don't hesitate to stay at this place! SCUBA diving, snorkeling nearby (coral, lobsters, fish, whales); diving and fishing trips to Desecheo Island and Mona Island National Park.